Let’s face it. No one wants discolored teeth. A less than sparkling smile can be socially awkward and put a huge dent in our self-confidence. We think if we find the perfect toothpaste and commit to brushing, flossing and rinsing with mouthwash with more vigilance then maybe, just maybe, we can counteract the yellowing and staining. The reality is, although each of these components of dental care are incredibly important, we do ourselves a disservice if we don’t look at one of the main culprits of dental discoloration – our diet. We love our pop but the sugar and acid it contains don’t love our teeth. Even diet soda is highly acidic and can erode the enamel on our teeth – exposing the yellow tissue behind it. 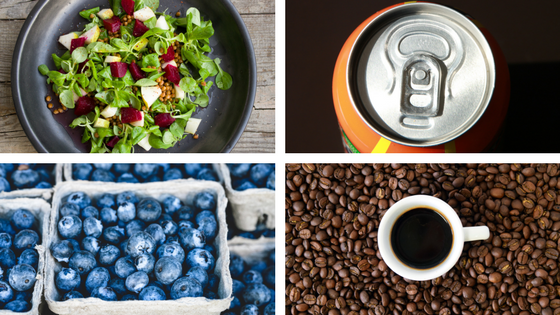 Most soda also contains artificial colors that cause staining. If you can’t kick the habit altogether consider sipping it through a straw to minimize the acidic effect. Tomatoes and tomato-based sauces are highly acidic – to the point where many people experience acid-reflux after consuming them! Your teeth are not immune to the effect of this acid. Tomatoes also have a deep, reddish hue which stains everything it comes into contact with – clothing, carpet and teeth included! If you’re concerned about yellowing teeth, minimizing tomato-based products will pay dividends in the dental department. Tea is a healthy alternative to soda but comes with its own dental challenges! 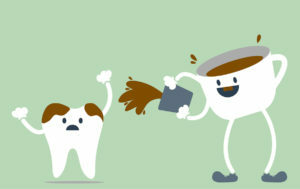 Not only is tea acidic but it contains tannins, or plant-based compounds, which make your teeth a magnet for staining. It’s helpful to rinse your mouth with water after a cup of tea or consider adding milk to your tea – the casein component of which can reduce acid and counteract the staining effect. Although highly-nutritious, beets are also deeply pigmented. Consider pairing them with cheese to experience the stain-fighting benefit of casein! Citrus is well-known as highly-acidic (citric acid, anyone?). Citrus fruits, while nutrient-rich, are enamel enemies much like soda, working to break it down and expose the yellow tissue, or dentin, under it. It is a common misconception that only red wines cause dental staining and decay on account of their rich pigmentation. Red wines contain much higher levels of tannins but both red and white wines are highly acidic and the acid from both red and white wine can intensify staining. A helpful tip? Enjoy hard foods such as nuts with your glass of wine to scrub away plaque and increase saliva production which helps neutralize acid. If you love Indian food but also love your sparkling smile try and minimize your consumption of these beautifully-hued spices and drink plenty of water with your meal. Coffee contains both tannins and chromogens, or natural dyes, and is very acidic. As with tea, consider adding milk to your coffee to counteract staining. Who doesn’t love fresh berries? They are nutritious, delicious and beautiful. Beware of their staining effect, however, and avoid berry-based jams and juices which have added sugar and compound the negative effect on your teeth. Don’t be fooled into believing that popsicles are a benign go-to for snacking. They often contain artificial colors and are actually loaded with sugar (processed or natural) which sticks to your teeth and creates a breeding ground for discoloration. If you are concerned about your smile and want to ensure proper care, Eggert Family Dentistry would love to help! We would be happy to assist you with a routine check up and cleaning or a professional teeth whitening treatment. Please don’t hesitate to contact us with any questions you may have!